/Manage Modules & Settings /How Can Mangoapps Admin Export All Users and User Profile Information? Admins are able to export users that are using MangoApps then utilize the information for your organization’s needs. 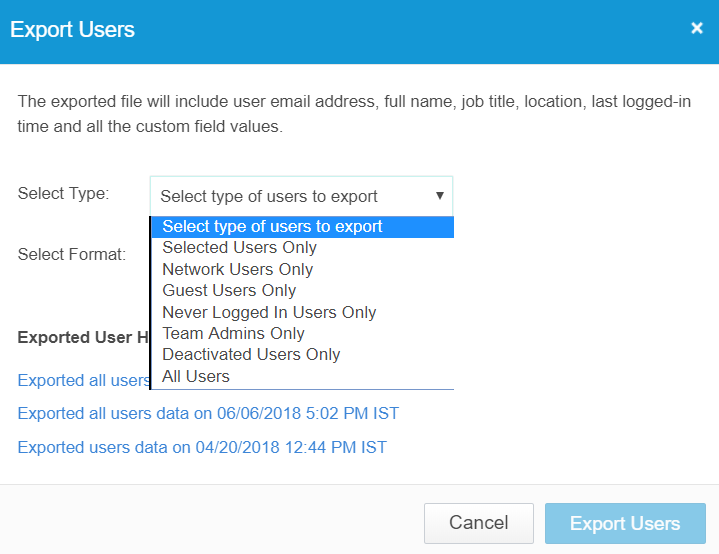 MangoApps allows admins to export users (based on the type of users) and share the list in an XLS or CSV format with others. 5. Admin can also select the format of the document that they wish to export such as CSV and XLS. 6. Admin can find the completed export under the Home > Account Info section in the admin portal. How to Manage Team Categories in Mangoapps? How Do I Re-label Project, Groups or Department Label? What Happens to Mangoapps when I Remove a Domain Level Module?